Mahopac’s Andy Scopino (R) won the 285-pound championship at sectionals. PLEASANTVILLE—In a day that saw several upsets, hundreds of area grapplers descended on Pace University Sunday for the semifinal and final rounds of the Section 1 Wr… Please login below or purchase a subscription to the Putnam County Courier to access this content. 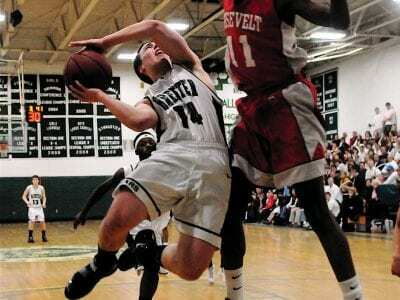 Left: Brewster’s Jordan Cirocco contorts his body on way to the basket – and runs into Roosevelt’s Darnell Glover. Photo by SKIP PEARLMAN. BREWSTER—It was not your typical first-round matchup. When the No. 5 seed Brewster boys hos… Please login below or purchase a subscription to the Putnam County Courier to access this content. Emily Tapio of Brewster soars to the basket in win over Tappan Zee Friday. Tapio finished with 29 points. BREWSTER—Emily Tapio came through with what has become a typical effort for her – 29 points, eight assists, seven blocks and seven r… Please login below or purchase a subscription to the Putnam County Courier to access this content. SOMERS—The No. 8 seed Kennedy Catholic High boys basketball team came up with a 60-50 victory over No. 9 Eastchester in a Class A opening-round game last Friday in Somers. Kennedy’s Frankie Kelly dropped six three-pointers on Eas… Please login below or purchase a subscription to the Putnam County Courier to access this content. PUTNAM VALLEY—The Putnam Valley high boys basketball team lost a 56-35 decision to Pleasantville in the first round of the sectional playoffs on Friday at Pace University. It was the first playoff game in the school’s history for b… Please login below or purchase a subscription to the Putnam County Courier to access this content. The Mahopac High boys basketball team’s season ended Saturday in the first round of the Section 1 Class AA playoffs with a 78-48 loss to Poughkeepsie on the road. That loss was preceded by a 46-42 victory over Mamaroneck on the road a… Please login below or purchase a subscription to the Putnam County Courier to access this content. BREWSTER—Heading into the weekend, the Brewster High hockey team knew it needed to win two of its last three games to qualify for the playoffs. After Friday’s disheartening 4-3 loss to Mahopac, the Bears’ season was on the verge o… Please login below or purchase a subscription to the Putnam County Courier to access this content. CARMEL—The Carmel High girls basketball team took the first step toward reaching the County Center last Saturday, blitzing RCK, 69-41, in a Class AA first-round playoff game at Carmel High School. Carmel, the No. 2 seed, virtually fini… Please login below or purchase a subscription to the Putnam County Courier to access this content. 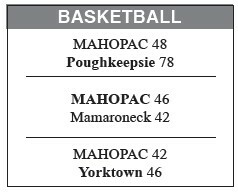 The Mahopac High girls basketball team ended its season with a 37-27 loss to Yorktown on the road last week. Junior Caitlin Hynes led Mahopac (0-18) with ten points, five rebounds and four assists. Junior forward and co-captain Brittany Cra… Please login below or purchase a subscription to the Putnam County Courier to access this content.